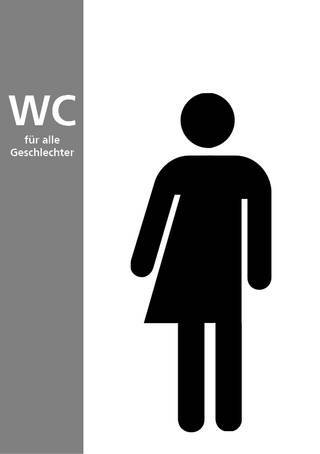 At the end of 2017, the Rectorate of the University of Cologne passed a resolution to install "All-Gender Restrooms" (mixed-use toilets) in all central buildings. Individual areas or institutions of the university are invited to mark shared facilities as such or to newly label individual toilet rooms as "WC für alle Geschlechter" (All-Gender Restrooms) - as long as a sufficient number of toilets for women and men remains. The realisation of the decision has now been driven forward by the Department for Facility and Property Management and the Vice-Rectorate for Gender Equality and Diversity, so that with immediate effect two toilets for all genders can be found in the Main Building of the University (U2.057, U2.056 - next to the Room of Tranquillity), in the Arts and Humanities Building (opposite the Information Desk) and on the Human Sciences Campus in the Modular Building (1.13, 1.14). In addition, Unisport has also set up two all-gender restrooms the ground floor of the sports hall ( Building 119BT1). In addition, the Main Building of the University, the SSC Building and the Main Building of the Faculty of Human Sciences are currently working on further possibilities.